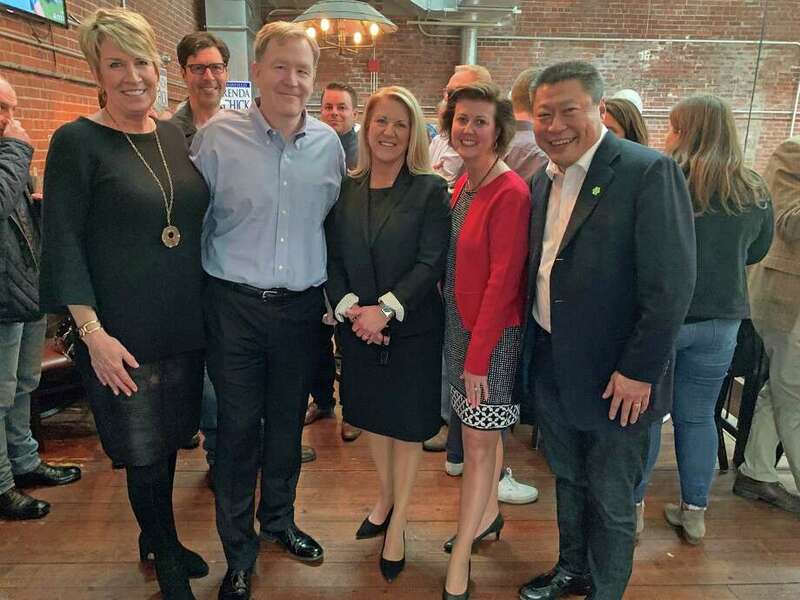 From left, state Rep. Laura Devlin, Board of Finance Chairman and running mate Tom Flynn, state Rep. Brenda Kupchick, Town Clerk Betsy Browne and state Sen. Tony Hwang attend a campaign kickoff fundraiser for Kupchick's first selectman run at Local Kitchen in Fairfield on March 14. FAIRFIELD — Town residents came out in full force Thursday at a campaign fundraiser for state Rep. Brenda Kupchick, who last month announced her intention to run against First Selectman Michael Tetreau. Dozens gathered at Local Kitchen and were high spirited as Kupchick, a Republican, confirmed her run to unseat two-term Democrat, Tetreau. If elected, Kupchick would be the second woman in Fairfield history elected to the position, after Jacky Durrell held the seat from 1983 to 1993. In 2011, Sherri Steeneck stepped in as acting first selectman. Board of Finance Chairman Tom Flynn, Kupchick’s running mate, has filed to run for selectman, and Town Clerk Betsy Browne will seek another four-year term. Inspired by her many years of active involvement with the Fairfield PTA, Kupchick began her venture into politics in the mid-1990s after founding an education advocacy group called “One Voice.” Soon after, she served on the Representative Town Meeting and as an active member of the Board of Education for more than a decade before being elected as a state representative in 2011. James Millington, the Fairfield Republican Town Committee concurred. “Brenda embodies what Fairfield is about, people love her, and she is so involved and connected. She has her heart in this and we are so happy to be supporting her, it’s going to be a great, positive campaign,” he said. Currently serving in her fifth term as state representative for Fairfield, Kupchick is a third-generation Fairfield resident and attended both Norwalk Community College and Fairfield University. She and her husband, Peter Kupchick, have owned a small business in Fairfield for more than 30 years and have one son. The Fairfield RTC plans to endorse candidates at a caucus scheduled for July 16.